Translated to Serbo-Croation, Oct. 23, 2012. The punched card as used for data processing, originally invented by Herman Hollerith, was first used for vital statistics tabulation by the New York City Board of Health and several states. After this trial use, punched cards were adopted for use in the 1890 census. The article on Hollerith's tabulating machine in Modern Mechanism, Appletons' Cyclopaedia of Applied Mechanics (1895, Page 832) contains illustrations of the mechanisms used to process the 1890 census. A brief description of the use of punched cards in the 1900 census is found in the January 1900 issue of National Geographic, pages 34-36, in an article by Dr F. H. Wines. By that time, Hollerith had also begun to work with the New York Central and Hudson Railroad and the Pennsylvania Railroad on applying cards to their data processing problems. The NYC&H use of punched cards was described in the Railroad Gazette on July 4, 1902, and reprinted a year later. This article has a good image of a Hollerith card from around 1900, and line-images of the tabulating machines. More early card images were published in the American Engineer and Railway Journal, Dec. 1906; page 468. All of the cards illustrated from these early railroad applications have 12 rows of 36 punch positions. Hollerith wasn't working in a vacuum! His idea for using punched cards for data processing was born while he was working as an assistant to Professor W. P. Trowbridge, chief agent of the 1880 U.S. Census for collecting statistics about industrial power. Dr. Billings, who was in charge of vital statistics at the Census, commented that there ought to be a machine for doing the purely mechanical work of tabulating population statistics. Billings and Hollerith discussed the possibility of edge-punched cards for this purpose. Slim - Medium - Stout. Young - Middle-aged - Elderly. Beard. Moustache - Chin - Side - None. From this, it is clear that Hollerith's major contribution was not the recording of data by punching holes in a card, but rather, the development of machinery to process that data and the development of a systems for data processing using this machinery. Hollerith's account of his invention does not mention the much older use of punched cards used to control Jacquard looms. Jacquard, working in France around 1810, originated the idea of using holes punched in cardstock to control the pattern a loom weaves. Conceptually, each hole in such a card can be thought of as encoding one pixel in the display created by weaving a fabric with different colors of thread passing over or under each other. Many Jacquard looms remain in use to this day, and you can occasionally find strings of Jaquard cards for sale. A high resolution image is available. The string of Jacquard cards illustrated here came from a small rug-making loom in a woolen mill in Amana, Iowa. Each card in this string is 9 inches long by 1.25 inches wide by 1/16 inch thick, but other Jaquard looms used different size cards. Like all Jaquard loom cards, these are strung together on cords. The heavy cardstock is required because the "card reader" mechanism of a Jacquard loom is entirely mechanical. Modern high-volume Jacquard looms use metal cards! 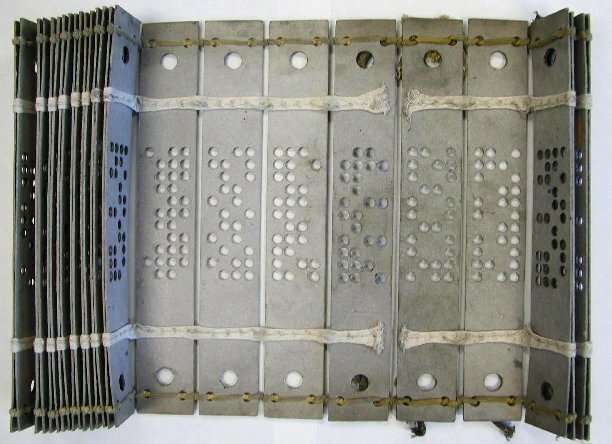 The use of punched cards in the Jacquard loom influenced Charles Babbage, who decided to use punched cards to control the sequence of computations in his proposed analytical engine. Unlike Hollerith's cards of 50 years later, which were handled in decks like playing cards, Babbage's punched cards were to be strung together like Jaquard's. Despite this and the fact that he never actually built an analytical engine, Babbage's proposed use of cards played a crucial role in later years, providing a precident that prevented Hollerith's company (and its successors) from claiming patent rights on the very idea of storing data on punched cards. Like many modern entrepreneurs, after Hollerith had perfected his first series of electromechanical punched-card machines, including a punch, a tabulating machine to accumulate statistics from the information punched on cards, and a sorting machine, he founded a company. As with many high-tech startups of today, Hollerith's Tabulating Machine Corporation had a somewhat rocky start until a venture capitalist and an experienced manager entered the scene. The financier Charles Flint merged Hollerith's company with three other companies to form the Computing-Tabulating-Recording Company and hired Thomas Watson to run the new company. Watson, who had previously worked for NCR, took over and renamed the company International Business Machines. Within a few decades, IBM had expanded to the point that the Federal government sued it for anti-trust violations. The overall dimensions of punched cards used for data processing have remained the same since Herman Hollerith settled on the card format. 7 3/8 inches wide by 3 1/4 inches high by .007 inches thick. Prior to 1929, this was a standard size for many US banknotes, and Hollerith apparently chose it so that he could store cards in boxes made for the Treasury Department. Eventually, most of a century after Hollerith's work, these dimensions came to be standardized as the EIA standard RS-292 media 1 punched card. The cards used to record the data from the 1890 census had 22 columns with 8 punch positions each (although there was room on the card for a total of 11 punch positions per column). The coding used on those cards did not encode data in columnar fields, but rather, each punch position was assigned a specific meaning. Hollerith continued tinkering with the way data was encoded, adding rows and columns to meet the needs of new applications. 24 colums of 10 positions each in the 1900 census (inferred from the 1900 National Geographic article), although published images of punched cards from the railroad industry in the same era all show 12 row cards with 36 punch positions per card. Cards used in the 1910 census apparantly had 27 columns of 12 positions each. By the end of the 1920's, IBM's established line of punched-card machinery used 45 columns of round holes per card and 12 punch positions in each column. In 1928, Hollerith's company, now renamed IBM, introduced the rectangular hole 80 column format, almost doubling the amount of data that could be recorded on a card, and by the mid 1930's, IBM was predicting that round-hole cards would soon be things of the past. IBM's 1928 design was the basis of what, decades later, came to be the standard punched card, eventually defined by ANSI X3.21-1967 governing the holes in the card and ANSI X3.26-1980 governing the use of the Hollerith code to encode alphanumeric data on cards. A high resolution scan is available. In fact, the round-hole format remained in use into the early 1990s, but in a very limited set of applications! The last use I am aware of is toll tickets on some eastern turnpikes. There are two reasons that the round hole format survived: First, IBM had a patent on their new rectangular format, so competitors were forced to limit themselves to the old format. Second, Remington Rand, one of IBM's major competitors in the pre-computer era, moved from Hollerith's code to a 6-bit code that allowed 90 columns of text to be stored on the old 45 column cards. 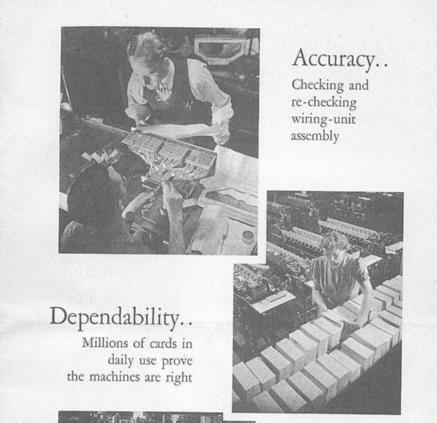 When Remington Rand bought UNIVAC, they naturally integrated their 90 column card format with UNIVAC computers. In many ways, the UNIVAC card code was superior to IBM's "improved" rectangular hole version! Oliver J. Jones wrote me that, in addition to surviving on some eastern turnpikes, UNIVAC's 90 column cards also remained in use through the 1960's at Macy's Department store and Lerner Stores, in the retail sector, the US Navy Medical Supply office and the Polaris missle control system, in the military sector, the New York City Tax Department, Long Island Lighting, and more. He sent along an image of the cover from a Remington Rand brochure and a promotional poster. Mike Albaugh wrote me that he helped dismantle a UNIVAC SS90 system in 1974 or 1975 that had been in use up until the week before. He also saw a similar UNIVAC system in use at the Concord Naval Weapons Station around the same time. These apparently used 90 column cards. If you look at the punched card equipment sold by IBM after 1931, you will find complete hardware support for IBM's alphanumeric Hollerith code, but you will also find that the majority of the machines sold were limited to numeric applicatons. At a time when, for example, the University of Iowa was punching student names on cards using the Hollerith code, other universities were developing 4-digit numeric encodings of common names so that they could avoid the need for the more expensive alphanumeric equipment. The book Practical Applicatons of the Punched Card Method in Colleges and Universities, edited by G. W. Baehne an published by Collumbia University Press in 1935, contains an excellent summary of the state of the art in punched card data processing in 1935, including an appendix that appears to be a reprint of IBM's catalog for that year and many illustrated descriptions of typical applicatons. When cards were used to store fixed-format information for data processing applications, they were almost always printed with format information, so that a casual reader could easily determine what punches on the card held what information. This printing could be quite specialized to one application, or it could merely set off fields in a standard way, with no indication on the card of what the purpose was. The card shown here is typical of those used with IBM's line of card processing equipment from the 1930's onward. This particular example was printed for a range of retail applications where it must have been expected that the customer would handle the cards, as indicated by the warning: Do not fold or mutilate. This warning would be unnecessary if the card were only to be handled by data processing workers. While most fields of this card have no clear purpose, it contains an interesting and very specialized feature, a tab the cashier was supposed to tear off along a perforated line when the card was processed. A card with this tab removed would be seen by card processing equipment as having a punch in column 1, row 12. It is important to note that the typical card processing applications from the 1890's to the 1950's did not require the use of computers! A deck of cards from a retail application, for example, could be sorted by the category field on a card sorter, and then each category could be run through a tabulating machine to sum the price fields of all cards in that category or similar accounting functions. Usually, fixed format cards documented the format on the top edge of the card, since keypunches almost always printed their textual information along this edge. Sometimes, as illustrated above, the interpretation was elsewhere. Such departures from the norm were most common on cards that were intended to be machine punched, as in this Gardner Denver wire-wrap machine card. This card was used to control a semi-automatic wire-wrap machine, the machine used to wire the backplanes of many of the mainframes and minicomputers of the 1960's. The wire-list for a backplane was typically produced with the aid of computer-aided-design tools, so this card would typically only be read by people during debugging. In the 1950's, IBM also supported a truncated version of the 80 column card, with only 51 columns. These were frequently used in retail sales and other applications requiring limited storage capacity per card; they saved both bulk and paper, but added complexity to IBM's card processing equipment to allow support of both formats. In many cases, they began life as 80 column cards from which a stub could be torn, for example, as a receipt, leaving a 51 column remainder for tabulation. With the advent of computers, complex pre-formatted cards continued to be used for to hold data, but in addition, cards were printed with formats specific to the needs of programmers. Some of these were equal in complexity to the standard data processing cards. The "IBM CALCULATOR INSTRUCTION CARD" shown here was printed in the early 1950's. This card may have been for the IBM 701, IBM's first general purpose computer, but it may well be for the IBM Card Programmable Calculator, the CPC, a machine that was neither fully electronic nor fully a computer. Regardless of the machine, this card is clearly designed for a fixed-format programming environment where fields of each line indicate addresses and operations. This particular card seems to include both symbolic locatons and numerical addresses. As programming languages grew more sophisticated, they shifted from fixed format to free format, and the preprinted material on cards began to shift to other functions. The card shown above is an assembly language card printed for Bell Labs, for the GE 600 computer they purchased in the mid 1960's as part of their work in the Multics project. This card contains a few fixed fields, but the artwork centers on a corporate logo, and to help programmers, much of the space on the card is devoted to documentation of the punch positions used for each character in the GE 600 character set. With the widespread standardization of high level languages such as FORTRAN and COBOL, generic punched cards for those language were widely sold. These were almost entirely free-form languages, with only a few constraints on format, but the tradition of cards with clearly labeled fields lived on for a long time. The FORTRAN card shown here is IBM stock number 888157. Aside from the unusual printing of the stripe down the zero row of the card instead of the top edge, it is indistinguishable from millions of similar cards printed around the world. As fewer and fewer users asked for cards with field markings specific to their applications, it became more and more likely that users would use cards purchased for one purpose for some other purpose. In open shops, such as university computer centers, this became a particular problem. Anyone could walk in off the streets and "borrow" an handful of cards. The solution was to order cards with custom printing to identify the institution! The card here is from one of the oldest computer laboratories in the world, the University of Illinois Digital Computer Labratory, home of the ILLIAC computers and builder of ORDVAC. 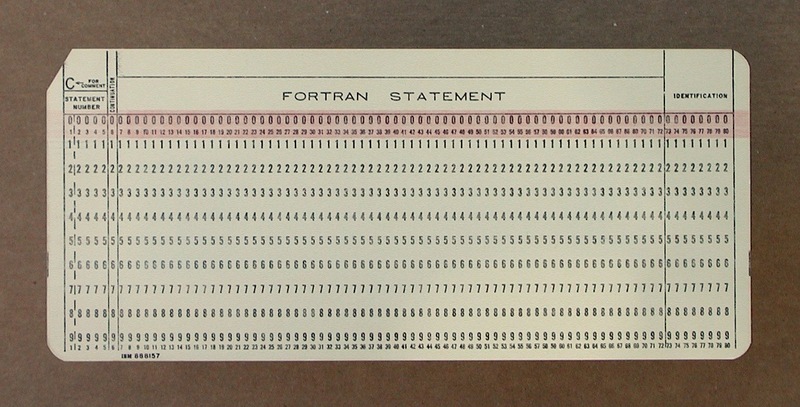 This card has two sets of column indicators across the top, one for printing keypunches, which printed directly above the column being punched, and one for IBM's standard line of interpreters, which printed the first 64 columns on one line and the remaining columns on the line immediately below. Of course, merely putting the name of the institution on the card is not very exciting, so many institutions, large and small, added corporate logos. Princeton University did this very nicely, as illustrated above. Princeton is noteworthy as the home of the Institute for Advanced Study, where, in 1946, John Von Neumann convened the Princeton Summer School and launched the computer age. The graphic design work that goes into making special printing plates for a punched card can cost money, so sometimes, institutions opted for a less expensive route, overprinting a standard form with their logo instead of designing the form around the logo, as Princeton did. The MIT card shown above is a remarkably crude example of this, from an institution from which better would have been expected. In fact, this card was a stopgap measure while MIT was in the process developing a modernized logo. In the 1960's, IBM introduced a 128 column card, containing 4 rows of 32 character positions each, where each character position was punched using a 6-bit code. 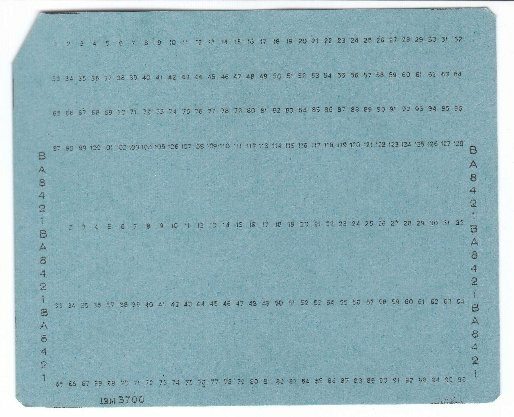 These cards, at 2 5/8 inches high by 3 1/4 inches wide, were significantly smaller than the original Hollerith cards, and they could boast 38 more characters of data per card than the old UNIVAC standard. These cards were introduced along with IBM's System 3 line of "small business" computers, and they were intended to displace 80 column cards from the market. Despite their obvious advantages, they never caught on outside of certain specialized applications, notably retail sales price tags and inventory management. The 128 column cards were also used with only 96 columns of punched data, leaving room for 4 rows of print along the top edge instead of the usual 3 rows. Most users considered these to be 96 column cards because punching the 4th row, the top row, punched through the textual version of the data, making it difficult for people to read what was printed there; furthermore, by the early 1970's, there was a strong demand for support for mixed upper and lower case text; this required the switch from a 6-bit to an 8-bit code. In order to maintain compatability, the high 2 bits of the 8-bit code were punched separately from the low 6 bits, subdividing the top row of the card (formerly reserved for columns 97-128) to hold 3 tracks of 2-bit data instead of one track of 6-bit data. Clever code design ensured that old cards, punched using the 6-bit code, were correctly read using 8-bit software so long as the card did not contain more than 96 columns of data. By the mid 1970's, most large scale data processing operations were at least investigating moving their punched card operations to timesharing environments, with their data stored on disk or magnetic tape, and by the mid 1990's, with timesharing mainframes and personal computers, the shift was almost complete, with very few businesses still using cards for anything other than scratch paper. Also known as data processing or keypunch cards. One of the last important uses of punched cards has proven to be be voting. Use of pre-scored punched card ballots was introduced in the 1960's, and despite problems in the 1968 general election in Detroit, where a sudden rainstorm drenched at least one load of ballots in transit from a polling place to the counting center, this format quickly grew to become the most widely used computer-based election technology. By the time of the contested presidential elections of the year 2000, it was estimated that 1/3 of the polling places in the United States still used punched card ballots. The problems with punched card ballots in the 2000 presidential election should not have come as a surprise. By the 1984 general election, the state of Iowa had effectively banned the use of punched card ballots, and in 1988, the Computer Professionals for Social Responsibility published a call for a general ban on the use of pre-scored punched card ballots (see http://www.cpsr.org/publications/newsletters/old/1980s/Fall1988.txt ). By the early 1990's mark-sense ballots and direct-recording electronic voting machines had both been developed to the point where they were viable replacements for punched card ballots, and in fact, by the year 2000, the major vendors of card based voting systems had all shifted their marketing emphasis to these newer technologies.